Most of us have a love-hate relationship with email. I love my daily emails from the Skimmed, and I love a good sale at Target. I don't love phishing emails or work email. Ok, so that was a slight lie, I don't hate my work email, but I do struggle with the lack of email etiquette that I often find. 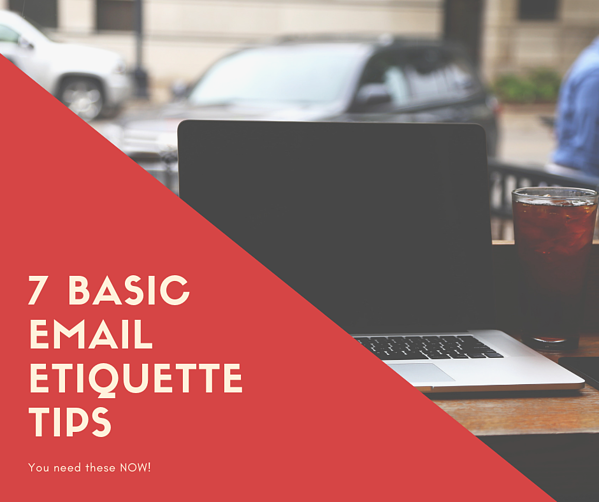 So here are 7 basic email etiquette techniques to make your life and everyone else better. Look, I am going to give it to you straight here no one wants to be on your "reply all" thread. Next time you hit the "reply all" button in your inbox take a second to check who else is on the email chain. Ask yourself "Does everyone on this email need to be part of my response"? If the answer is no, then remove them, you are now decreasing how many emails they have to read and delete (tips to reduce email anxiety can be found HERE). We all move fast at work and sometimes it is easiest to just forward an email over to someone else. If you are doing this, you are doing everything wrong. Jenna needs a report and has emailed you, but Ken is the one who handles the report. Don't take Jenna's email and just forward it over to Ken. The proper protocol here is to respond to Jenna and copy Ken in. Something as simple as "Hey Jenna. I don't handle the TPS report; Ken is going to be the one who can assist you in getting this. I have copied Ken here who will be assisting from here." This is simple and easy, and it tells Ken what is needed/expected of him. Pro tip here for Ken make sure you remove unneeded people from the email. All email senders think their email is the most important email. Newsflash, probably not but don't tell them that. When you see an email come through but are in the middle of something or have a list a mile long it is your job to set expectations politely. A simple "Hi Sally. I saw your email come through I have about three things to finish up. You can expect an update on the TPS reports in about two hours." On the flip side; you have sent over an email and are awaiting a response. Take a second and think about who you just emailed. Are they super duper busy right now? Do they work in a different time zone? Could your email have been buried overnight? If the answer is yes, then be patient, and send a friendly follow up email asking when you can expect a response. Don't forward emails over to people and then expect them to figure out what you want from them. First, no one wants to read 17 emails down to figure out what is going on. Second, think about how much more time this will cost you in the long run. You blind forward an email; the person gets the email and tries to figure out what you are requesting; they can't figure it out; so they email you back, and you have to explain. You are chatting via email about TPS reports, and then your boss starts asking you about the new timesheet software you are implementing all in the same email thread. This is the perfect time to open up another email and start a new conversation. Six months down the road when you are trying to find that email about your timesheet software, you will thank yourself. Also just as a side note, don't only respond to your last email with someone just because that is where you found their email address. It is 7:15 pm and there is a problem, so you send an email; bad move. Most individuals try not to check their email after work hours. If you have an emergency or need something ASAP send a text message or make a phone call, you are more likely to get a response that way. Also, if you need something done first thing in the morning and it is late at night you can use the delayed delivery button to ensure your email does not get buried. To Long Did Not Read! Know who your audience is before you click send. Some team members are only going to read the first line, while others will need lots of follow-up information. By knowing how to talk to each person you are emailing you are ensuring that your emails are getting read! Also, a good rule of thumb is not to write more than 150 words.